Dutch designer Dorhout Mees knows how to wow the Dutch fashion lovers! Dorhout Mees showed a gorgeous collection for the S/S 2015 season. The collection named ‘O’ made my mouth fall open and made me sigh of the beauty I saw on the runway. Dorhout Mees was inspired by water crystals and how they transform under influence of the environment. For example tears of joy has balanced water crystals that look pretty. While tears of pain or sadness look messy and broken. Within ‘O’ you can see this inspiration in different parts of the designs, like the shapes, prints and the use of material. The collection has a clear idea while managing to show different elements and skills of the designer. Most looks had soft shapes, but some looks showed harder less flowy lines. 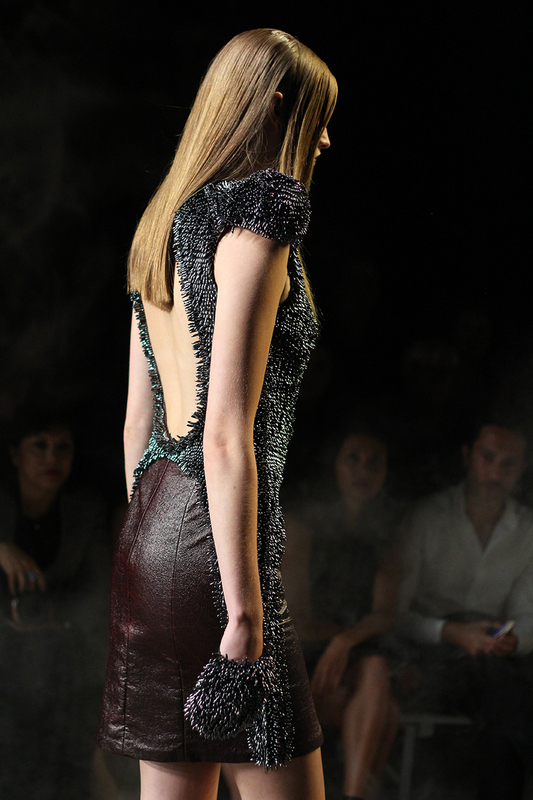 The beauty of water and water crystals was really something that the collection tried to express. And they managed perfectly! The diversity, originality and feminine looks from the collection made me say “Ohhhh” more than just a couple times. I really loved the shapes from the designs, the use of different colors and materials. Can you imagine going to a special occasion wearing one of these fabulous pieces? Turning heads? I for sure can! My final thought? ‘O’ my God, this designer is good! Thanks to Dorhout Mees and PR agency Ganbaroo for inviting me! I loved the show! What do you think of this collection and my photos? Let me know in a comment. 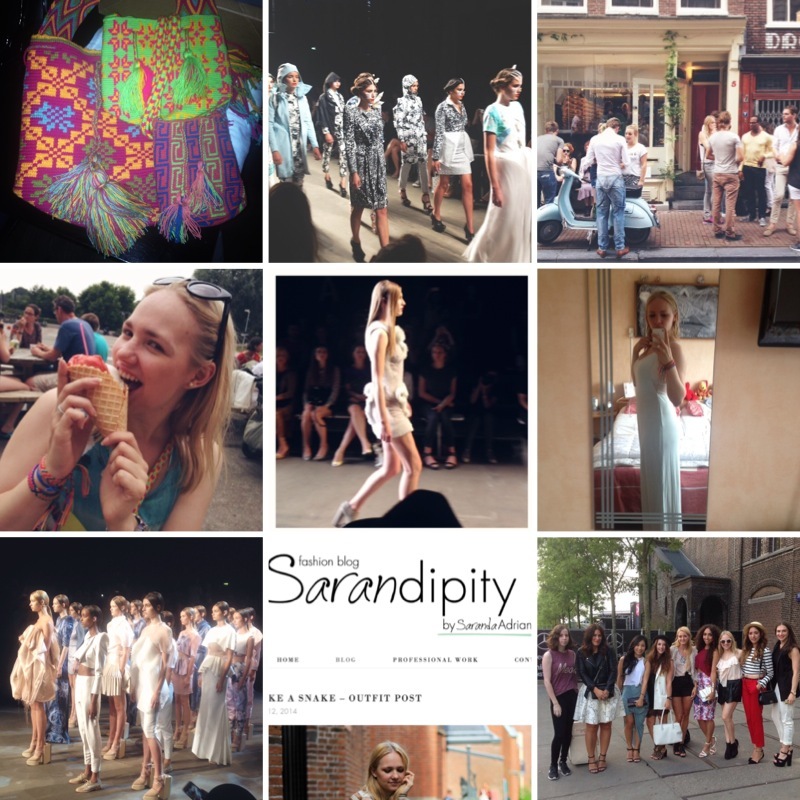 More than two weeks ago already, gosh time flies when you are having fun (or working hard ;)) I went to fashion week and saw some amazing shows. One of these shows was the show from Zyanya Keizer. In a nutshell, fierce, rock and roll, tough, spiky and speaking to your imagination.This fashion show was truly one that blew my mind and stayed there for a couple of hours maybe even days. Wondering what the idea and point of view behind this collection from Zyanya Keizer was. Maybe taking girl power to the next level?! I don’t know for sure but what I do know is that I loved the designs! Some were super fierce almost monstrous while others were softer, more fluffy and feminine. The bead work intrigued me while the models where strutting down the catwalk. The movement in the beaded designs was amazing and lucky me I caught some of those movements in a photograph! Did I already say that this collection amazed me? The diversity within the designs but with a clear red thread made me love almost every single piece. From the red beaded dress, to the black beaded dress (enchanting movements), the icy but soft looking crystal white dress with gorgeous embellishments, the leather pieces, the eye-catching collars. I loved it! Thank you Zyanya Keizer for this gorgeous collection and good luck with your design career!! 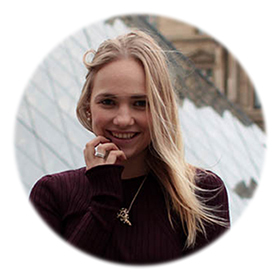 Today I want to share my view on the Ready to Fish show with all of you.Ready to fish by Ilja Visseris a ready to wear line with casual and chic items. Unfortunately my own photos did not turn out that well so all credits for these photos go to fashion photography Peter Stigter and his team!During last winters fashion week I got to see my first Ready to Fish show and I fell in love with the skills of this designer. The pieces shown were original and very wearable. This edition I was super happy when I got an invitation and I was looking forward to seeing this show a lot. The show started and I immediately recognized the simplicity and femininity that I had seen at the previous show from Ilja Visser as well. The collection was playful and mature with graphic prints, primary shapes on some designs (which made me think of the fashion is art trend as seen at Celine, Prada and Chanel for S/S2014). Ilja Visser showed us with her new collection that she can design for different types of women. Besides simplicity and femininity her designs showed sophistication, sportiness, and some items where really chic as well. Above all I loved the use of happy colors, both popping colors and soft colors, like lilac, yellow, lavender blue, purple and of course black and white. Of course I picked out some favorites and to my surprise most of them are looks with the lilac / lavender blue color. So this color really gets my attention. It’s probably because in these colors every skin color looks gorgeous and I think this color is very easy to style as well. My favorite items where everything from the second look (above), the off-white sweater and jacket from look 5 & 6 (below) and the total looks 8 & 9! Wow I am having a lot of favorites haha. I can not wait for this collection to come in stores and shop some of them to show you next summer! Oh my it’s late already! Almost time to go to bed… But before I do hit my soft mattress, I want to share some photos from one of my favorite fashion shows at MBFWA: IINUA. On my first day I was happy to be able to attend the show from Joelle Boers & Bregje Cox, two very talented people graduated from the Academy of Fine Arts & Design in Maastricht. I was super excited for the show and made sure to have a nice spot in the audience so I could make some cool shots. 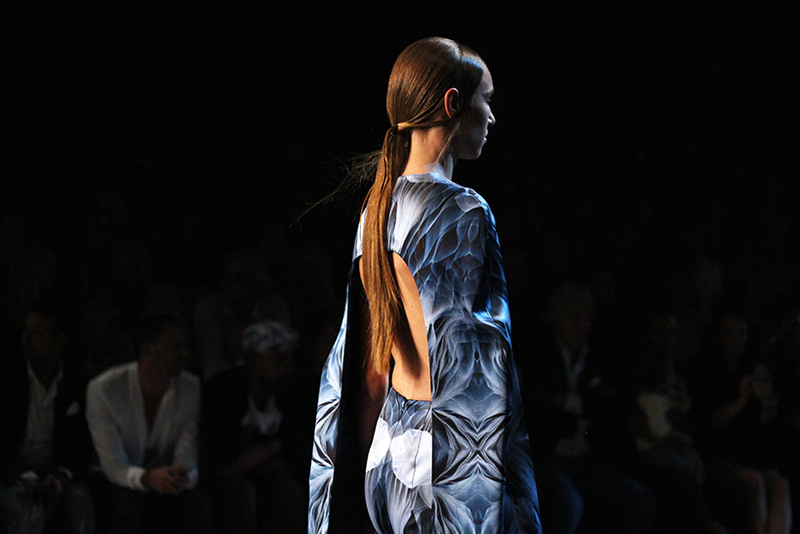 The designs, inspired by the native Inuit tribes, showed gorgeous graphic prints looking like rocks and crystals. All the details in the designs fell into place perfectly, including the gorgeous killer shoes by Chris van den Elzen and the masks. The use of a soft and icy blue with a little bit of sea green gave the IINUA collection even more power. Overall this collection really got stuck in my mind. The items where really wearable as well as original and creative. I think that this fashion show might have been one of the best ones I have seen during this edition of MBFWA! Some of my favorites were the skirt with see-through material, the gemstone sweather (comfy!) and every item of the fifth look (see below). I might even buy them if possible and affordable! I am looking forward to hear and see more from Joelle Boers & Bregje Cox! On Friday I went to a couple of shows and also went to the 1 year anniversary of bckpsace eyewear. I also had a HUGE icecream since this was cheaper than buying water at Fashion Week haha. Furthermore you see in the collage, me picking an outfit, more fashion shows, an option for my new logo and me and my blogger babes! 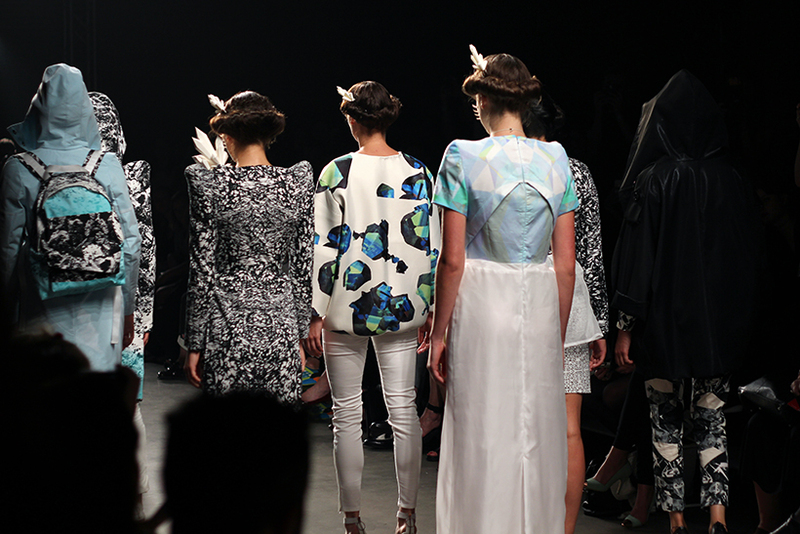 Later this (and next) week you will get to see my full MBFWA reports on all the fashion shows! Stay tuned dearies!